Interstate 269 is the outer beltway for Memphis, Tennessee. Beginning in Hernando, Mississippi, I-269 extends eastward from the exchange joining I-55 with the western leg of I-69 to Tunica. Traveling east along side Mississippi 304, the beltway meets Interstate 22 and U.S. 78 at the town of Byhalia on the Marshall County line. Turning north, Interstate 269 crosses into Tennessee ahead of U.S. 72 and the town of Collierville before overtaking SR 385 at Bill Morris Parkway. I-269 superseded SR 385 northward to Interstate 40 in the town of Arlington. 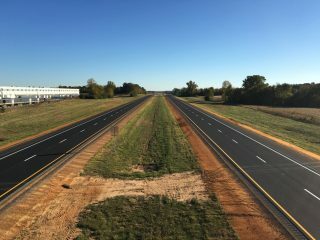 The remainder of the SR 385 beltway west to U.S. 51 at Millington is a part of future I-269, as the connection with Interstate 69 north from Memphis is incomplete. Tennessee State Route 385 preexisted Interstate 269 along the Memphis beltway system between Collierville and Millington. The south leg of SR 385 along Bill Morris Parkway between Interstate 240 and Collierville is built to Interstate standards but is not a part or planned for inclusion into the Interstate Highway System. For a time prior to the I-269 designation, the beltway route was considered for the alignment of Interstate 69. However, city of Memphis officials prefered I-69 to pass directly through the city, so the bypass was eventually renumbered. The beltway was also briefly referred to as Interstate 669 on misc.transport.road, but without a verfied citation. 33.6 miles – Google Maps Estimate for the entire route in Tennessee west to U.S. 51. Looking south at Interstate 269 from the Wingo Road overpass in Marshall County, Mississippi. Photo taken by Trevor B. (10/19/15). Construction for Interstate 269 through northern Mississippi presently was partioned in eight segments. Focusing on grading and bridge work by the eventual interchange between I-22 and 269, the first broke ground in July 2012. Fall 2012 construction followed west from U.S. 78 to MS 305 and from I-55 & 69 east to Getwell Road. Heading north from the folded diamond interchange (Exit 18) with Donelson Farms Parkway, Interstate 269 gains an auxiliary lane to the eastbound on-ramp for I-40 to Nashville. Photo taken 06/01/10. A short distance separates the Donelson Farms Parkway overpass with the full cloverleaf interchange joining Interstate 269, Tennessee 385 west and I-40. Photo taken 06/01/10. A loop ramp takes drivers onto Interstate 40 west from Arlington through the east suburbs of Memphis. Photo taken 06/01/10. SR 385 ends at a half diamond interchange with U.S. 51 at Millington. A future extension of the freeway west will be built to connect with I-69 north from the end of SR 300 in Memphis. 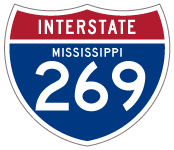 Interstate 269 concludes at a cloverleaf interchange with I-55/69 north to Southhaven, I-69/MS 304 west to Tunica and I-55 south through Hernando. Until 2017, Interstate 269 concluded a short distance south of the Tennessee state line at a partially opened diamond interchange (Exit 23) with Mississippi 302. Photo taken by Trevor B. (05/26/16). Exit 23 connects I-269 south with Mississippi 302 west to Olive Branch and east to U.S. 72 for Corinth. Photo taken by Trevor B. (05/26/16). Pylons shunted drivers onto Exit 23 as Interstate 269 temporarily ended. The ensuing section of I-269 opened on December 5, 2017. Photo taken by Trevor B. (05/26/16). Approaching Interstate 269 and Mississippi 304 on Mississippi 302 east. Photo taken by Trevor B. (05/26/16). Mississippi 302 east at the temporary south end of Interstate 269. Photo taken by Trevor B. (05/26/16). The northbound on-ramp for I-269 & MS 304 from MS 302 east references the nearby town of Collierville, Tennessee. Photo taken by Trevor B. (05/26/16). “Parkway may Start by Oct. 1.” The Commercial Appeal, September 13, 1990. “Nonconnah Plan Change is Attributed to Land Cost – State Shifts Route South.” The Commercial Appeal, October 24, 1990. “DOT Approves New Segment for Parkway – Riverdale, Bailey Station Route Considered Less Costly.” The Commercial Appeal, July 17, 1991. “Parkway Neighbors Await Traffic – Residents Anticipate Benefit, Bane.” The Commercial Appeal, October 15, 1992. “Parkway continues to move eastward.” The Commercial Appeal, December 8, 1994. “Parkway Will Shift Toward Collierville, Take Homes.” The Commercial Appeal, December 24, 1992. “Work Begins on C’Ville Stretch of Parkway.” The Commercial Appeal, June 5, 1997. “Nonconnah Finish Pushed Toward Spring.” The Commercial Appeal, September 2, 1993. “Eastbound leg of Nonconnah opens today.” The Commercial Appeal, December 24, 1993. “New Nonconnah – Commuters zoom onto parkway.” The Commercial Appeal, December 23, 1995. “Nonconnah’S oopen Monday to Collierville.” The Commercial Appeal, December 24, 1997. “Morris Road Zips through Legislature.” The Commercial Appeal, February 27, 1998. “Nonconnah 2 Miles Closer to I-40 Goal – Collierville Segment Opens to Rush of Engines.” The Commercial Appeal, October 20, 1999. “Morris Parkway Section to Open.” The Commercial Appeal, November 21, 2000. “Extension to Fayette of Tenn. 385 Starts.” The Commercial Appeal, June 5, 2003. “Longer span to spare Wolf River wetlands — But growing bridge adds $12 million to Tenn. 385 project.” The Commercial Appeal, March 28, 2005. “Access: Fayette County — New stretch of Tenn. 385 puts Piperton on short route .” The Commercial Appeal, August 22, 2007. “Tenn. 385 opens up Arlington — New stretch of highway hailed for its access to progress.” The Commercial Appeal, September 5, 2007. “Three-mile segment of 385 opening — Piperton hopes to benefit from Interstate.” The Commercial Appeal, June 14, 2009. “Final leg of Highway 385 opens to Mid-South drivers” WMC (Memphis, TN), November 22, 2013. “Highway Plan to Interrupt Rustic Privacy – Millington-Interstate 40 Link Slices at Rural, Homes, Farms.” The Commercial Appeal, September 5, 1991. “Paul Barret Parkway Slated for Opening on Friday.” The Commercial Appeal, September 23, 1998. “New Barret Link to I-40 Expected to be Boon for Suburban Area.” The Commercial Appeal, January 4, 2000. “States choose pair of routes for I-69 — Next up: impact statements, funding.” The Commercial Appeal, December 1, 2004. “I-269 Ribbon Cutting Scheduled for October 2.” MDOT, press release, October 19, 2015. “AASHTO Spring 2016 Route Numbering Applications – Ballot Results.” Special Committee on U.S. Route Numbering May 24, 2016. “Memphis to Byhalia nonstop: I-269 and I-22 now intersect.” Commercial Appeal (Memphis, TN), December 8, 2017. “I-269’s completion marked with ribbon cutting in DeSoto County, opening its final stretch.” Commercial Appeal (Memphis, TN), October 26, 2018. Page updated February 9, 2019.